Is it better to paginate a long article or show the entire article on one page? The following is a side-by-side of the same article. On the left is page one with navigation and on the right is the full article. Is there data to support that one is better than the other? If so, what makes it better? 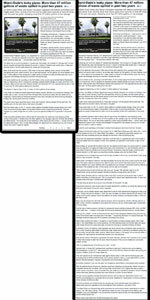 The following is an example of the article navigation for a long article. The user is given the option of just seeing the whole story, skipping to a particular page or going to the next page. Wouldn't it be easier (read: better) to give the user access to the entire article right away? If the user reads the first page and then decides they want to see the full story, they'll go through a page refresh and be taken to the top of the page with the full story. That can't be a good UX right? My hunch is this is some sort of ploy to get more clicks on a site, but perhaps I'm missing a real reason why paginating a long article or post might be better. It's no longer necessary to paginate for users, but content providers love it for advertising. Common knowledge among content strategists in my work is that you paginate in order to increase advertising impressions. A slideshow with ten slides gets ten times the impressions as an article with ten photos. And an article with three pages gets … well, you get the idea. In the old days, pagination was about bandwidth. And in the old days, people didn't know or want to scroll. But those days are long gone. Although people weren’t used to scrolling in the mid-nineties, nowadays it’s absolutely natural to use the browser’s scrollbar. For a continuous and lengthy content, like an article or a tutorial, scrolling provides even better usability than slicing up the text to several pages. And Google is pushing the full-page version in its search results, essentially saying "full pages are better than paginations." Content Strategy blog Eating Elephant writes about it here: Google JUST SAYS NO to Overpagination. Interestingly, however, multiple pages can be used to track engagement: if users exit on an article page, you can't tell how long they were there, but if they click through each page, you can track their time on each page and how far through the tunnel they've gone. Magazine's Online summarizes this nicely, based on original comments in Twist Image's article on multiples page trickery. Put a "full article" link with pagination somewhere at the top as well as the bottom. (If you only include a "full article" link, you run the risk in some cases of the user believing they are only looking at an abstract, rather than the beginning of the article. If employing responsive web design principals, serve paginated articles when download speeds will degrade the experience of a full article. If and when you paginate, do clearly indicate at the top what page the user is on, in case they land there from search results or a link. [From an in-house developer] If you want the advantages of pagination with a full-page experience, use progressive loading as you see on Facebook and Twitter (also called "infinite scroll," although in this case it's finite). Mashable does a good job of paginating when it improves the experience and defaulting to one page otherwise. Here's a nicely paginated slideshow on pregnancy time lapse videos, and here's a nice full-page article on self-driving cars. Note that the slideshow loads an ad with each slide (often the same ad). New York Times appears to have designed some flexibility into their system by making pagination beyond the first page a request string in the URL. That way, if they decide to change to full pages, the URLs don't break (I surmise). Anyway, NYTimes breaks into pages without feeling egregious. If you paginate content like it was a book page just because it has a specific height, you end up with content that has to be clicked through in order to consume. That is several not very useful steps putting extra effort on the user - for no reason at all. If you need to hide content because of length - use a toggle function read more... and read less..
Users who consume large content would like the ability to search within the page - which is not possible if you paginate long content. I've seen user hitting ctrl + F and then started typing to find exactly what they need - faster. Having pagination makes this process much harder. Don't forget that some users want to print some articles. Pagination, of course, makes this a royal bother. To provide this feature, some sites put a link to an un-paged view on the article, but there will always be some poor users who don't find that link or don't even know to look for it. The obvious answer of ad impressions is probably paramount. Advertisers want to show advertisements to large audiences and tripling your page views is one way to fake it. However, I wouldn't be surprised if paginated articles hold users hostage at the website for a longer viewing period, and as such forcefully creating an extended viewing period. By splitting up relevant information into chunks the user is forced to look around and conjure up a way to navigate to the next part of the article. In doing this they waste time skimming over other perhaps higher priority articles of interest that might choose to jump to. You are essentially training the user to learn your website, all without telling them directly. It's like the test drive at a car dealer: gives you the illusion it's yours, then they go in for the kill. If the user reads through a paragraph or two and finds the writing hopeless they can opt to quickly jump to another area of the website they are presently browsing. If the user wastes 3x the time reading hopeless material they may become discouraged and opt to exit to another website altogether where they reason they will waste less time. Stranding a user half way down a page with limited navigation and exit points leave the user with essentially 2 options: scroll up to find out what else they can do, or leave to a better website. A huge influx of traffic to these article websites may be generated via linking from other websites. When a user arrives for the very first time you don't want to overwhelm them with information. Just the bare necessities, and you want to encourage them to venture around on their own accord. Having a page with a seemingly infinite scroll bar will cause a user to think twice about what their time may be worth, and if they are willing to contribute an excessive amount of time to read this content vs the value they are getting. I know I've skipped over many articles despite them being interesting because I simply don't have the time to lend and I know it's false hope, because I'm not getting it back. Reading long text is hard! I recon the same reasoning newspaper columns are only but a few inches wide, and couple tall. Keeping information in small concise chunks may help garner their attention. I could certainly be far off and think this is an interesting question. I'm keeping my eyes peeled on this one! Just read an article at Scientific American (The Reading Brain in the Digital Age: The Science of Paper versus Screens) that provides another view on pagination. Some studies showed that scrolling uses more cognitive resources than turning to the next page. "Although people in both groups performed equally well on the READ test, those who had to scroll through the continuous text did not do as well on the attention and working-memory tests. Wästlund thinks that scrolling—which requires a reader to consciously focus on both the text and how they are moving it—drains more mental resources than turning or clicking a page, which are simpler and more automatic gestures. A 2004 study conducted at the University of Central Florida reached similar conclusions." So I think saying "no pagination" is not such a simple answer as it might appear. Without pagination readers also have no trail of where they are and how much reading is left. Scrollbar gives you some idea but it is not as precise as the page number. Pagination while trying to avoid a scroll bar is mostly done for ad impressions, but there are a few good sites that do try to think of user convenience - as @Ken mentioned, providing a print version. This is usually in a single page, it also lacks some of the formatting & background images but that is a small price to pay. I'd like to add that as a user, if the article is really long I would still prefer no pagination; but in combination with section links within the document and maybe a TOC & links to go there easily from within sections. I agree with most of the sentiments against pagination, though there is one use-case that is not addressed well with long, non-paginated articles: It is typically difficult to share a subsection of such an article. However, this is not sufficient justification to use pagination: The Verge (sample) uses a very nice system to address this problem without resorting to multi-page content. I don't think paginating a single piece of cohesive content is a good practice, but there is one other reason that occurred to me why some might do it. It can be useful to determining whether users are actually reading the article. While a user may land on a page, that doesn't mean he actually read it. Even if he started, he might decide its too lengthy and abandon the effort. With a paginated article, a site could possibly use stats to determine that the article was actually read. It's one thing to earn money from advertisements. It's another thing for an author to actually have his works read and some might want to confirm that. It was definitely advertising staff pressure that lead to my former employer -- a newspaper site -- paginating almost every article, regardless of length, from the mistaken belief that spreading content over double the pages would double the inventory and offset a steady decline in sitewide page views. In addition, the ad staff larded a series of ads, widgets and other experience "enhancers" onto each page, making other news sites far more attractive. I'm a firm believer in NO pagination. Besides the reasons listed above, I frequently use tools like Evernote page clipper to save articles, but if the article is paginated, then I just don't bother. Also, I would assume that Google looks at each page as an individual article, so trying to optimize each split page for relevant keywords could be difficult. Note: My response may be a little late; but the problem is still there, so answering this on this thread. IMAO, most of the high-traffic sites still miss some very important points from user perspective. Over the time since the online era, our subconscious as well as conscious mind are well-trained to ignore ads altogether and focus on the content, mostly on relevant picture. e.g. when i entered a NYTimes for news on Iraq, the new shiny Ford(ad) is totally irrelevant (hence, irritating). In return, my subconscious mind take a silent note on this irritation (entirely due to the ad). As a try to address the fact, ad engines (syndicates) tried to deliver contextual ads and collect and relate search data. What is the result? once i just needed to know(so, searched) a fact about Nikon D800. Now, everywhere i just see ads of DSLRs. As i already have one, i am not even remotely interested to buy another one. Now, what? My irritation just got a polynomial factor. Our monitors, even on laptops, are mostly now widescreen(16:9) rather than archaic 4:3. But, the sites mostly are failing to adopt the new display real-estate. Instead the ad's column (on the right) just multiplied. Yet still, pagination is the worst factor to "dishonor" the visitor's "mission statement". In my utopian world of internet, a friendly and readable (yet, revenue generating) site should be like this. Not the answer you're looking for? Browse other questions tagged website-design pagination or ask your own question. Pagination - a thing of the past? Should I use pagination for longreads? How can I place contents on the body of this site layout without making it look like it's floating? Which design for internal pages not represented in site navigation? The Name of a Full-size Device-independent Start View with tagline only content and downward pointing arrow to access the site? Intranet static menu: Below or above page banner? Summary above the article or in the sidebar? How should I design scrolling on my web site?